Home / Blog / Universal Heart gifts for mind & spirit! Greetings! With just days to go until Christmas, most of us have our minds on gift-giving and I’m aware how fortunate we are to live where most of us can so freely give and receive. With giving in mind, I am sending you some suggestions that I hope will be stimulating and appropriate for you and your loved ones. They include targeted “Gifts of Change” through IWDA, recent and classic books, audio books, CDs, and even retreats in Australia, New Zealand or Japan that you may want to “give” yourself – or a loved one. Books continue to make wonderful gifts, don’t they?! And yes, I know e-books are growing in popularity, and so are MP3’s, but there’s nothing like unwrapping a small, book-shaped parcel…! I’m recommending quite a long list of different writers and books below. Of my own books, I would love you to consider EVERYDAY KINDNESS, my new book written to celebrate this timeless quality in practical, accessible ways. Or perhaps your dear ones would prefer SEEKING THE SACRED, a most beautifully produced book that’s still very new and is so close to my heart. You may also like the new unabridged audio versions, read aloud by me, of SEEKING THE SACRED and, just out, FORGIVENESS AND OTHER ACTS OF LOVE. These are ideal for people who travel/ drive a lot, or who enjoy the ease of listening rather than reading. The sound is great and they can be purchased either as MP3 downloads, direct from Bolinda, or as a very “gifty” boxed CD sets from my on-line bookstore – details below. For those of you who want to give a meditation CD, I can especially recommend GRACE & COURAGE, or the quieter, more recent PEACEFUL MIND. Those of you buying from outside ANZ may also like to find the brand new US edition of IN THE COMPANY OF RILKE. It’s a book that breaks open the worlds of beauty that really only music or poetry can begin to express! There’s lots in it too about that most fascinating man, Rainer Maria Rilke. I spent years writing it and the experience was one of the highlights of my writing life. 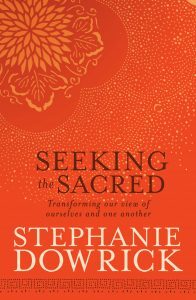 You can also buy SEEKING THE SACRED in its handsome US hardcover edition. This year I’m also suggesting some terrific books from other writers. These can be found in your local bookstores, or from my website bookstore where you’ll find a prominent “Recommended” list of new and older treasures. From that extensive list I’d like to highlight two exceptionally fine, absorbing recent novels, Anna Funder’s ALL THAT I AM and Geraldine Brooks’ CALEB’S CROSSING. I can also highly recommend Stephanie Saldana’s wonderful memoir of living in Syria, seeking the sacred in a culture both like and radically unlike her own: THE BREAD OF ANGELS. A talented American novelist I’ve been rediscovering this year is Allegra Goodman. I’ve enjoyed all her fiction, including the newest, THE COOKBOOK COLLECTOR, but perhaps my favourite is still KAATERSKILL FALLS, about a traditionally Jewish, predictably complex family. Ann Patchett’s glorious, absorbing BEL CANTO is not new but is always near the top of my short list. If you’ve already read that, you will enjoy her newest: STATE OF WONDER. For anyone looking for books about reading, I can suggest Brenda Walker’s READING BY MOONLIGHT, Robert McDowell’s POETRY AS SPIRITUAL PRACTICE and my own book, IN THE COMPANY OF RILKE. And for those who want intelligent reading on food for the body (not just mind and spirit! ), Australian writer Janella Purcell offers gluten-free, vegan and vegetarian options – and lots about food – in EATING FOR THE SEASONS. Classics worth discovering or re-reading include Piero Ferrucci’s beautiful book, INEVITABLE GRACE, Lewis Hyde’s THE GIFT, plus Andrew Harvey’s glorious THE ESSENTIAL MYSTICS, Thich Nhat Hahn’s LIVING BUDDHA, LIVING CHRIST, and THE GOOD HEART which offers teachings from His Holiness the Dalai Lama on the Christian “Beatitudes”: the famous, exquisite Sermon on the Mount. All are on my “recommended” list. Because I can’t sign books sent out by Collins/Seek, those ordering books for Christmas/Hanukah from my on-line bookstore may request a greetings email sent direct to your recipient – or you. This will read: “Dear …. May the blessings of peace and kindness be with you at this holy season and always.” You need to make that requestseparately from placing the order. Email me at uhn@stephaniedowrick.com and please put EMAIL REQUEST in the subject line. Don’t forget to include the person’s name and their email address (as well as yours!) and note whether you would like the email sent immediately or on 24 December. Details of the retreats follow and with Christmas fast approaching I also want to remind those of you in Sydney that we will have a spiritually inclusive service at Pitt Street (264) Uniting Church this coming Sunday, 18 December, at 3pm, with glorious music from Jassen Rose and Elizabeth Lecoanet. You are also invited to the Christmas Eve 11pm service at Pitt Street , a sacred service that’s inclusive and quite exceptionally beautiful. I am always thrilled to welcome those of you joining the retreats via this Network. Early in the New Year, I will send out a more complete list of retreats and workshops for 2012. Meanwhile you could choose to give yourself – or someone else – the priceless gift of peace of mind and inner renewal and purpose that comes with a spiritual retreat. Please book with the organisers as soon as possible. All have strictly limited accommodation and numbers. Start your year with peace & purpose: a spiritually inclusive 2-nights retreat at the beautiful, peace-filled Brahma Kumaris Centre for Spiritual Learning, 150 Macarthur Drive, Wilton NSW 2571. Retreat leader: Dr Stephanie Dowrick. Inclusive cost: $350 (Friday dinner to Sunday lunchtime.) To book please send a cheque for at least half the cost now, and balance by 14 January 2012. Cheque or money order to: Brahma Kumaris Centre for Spiritual Learning. Please include your name, address plus email details for acknowledgement, and state that it’s for the February interfaith retreat. The annual 4-nights Easter Retreat at Mana Retreat Centre, Coromandel, NZ. Dr Stephanie Dowrick has been teaching at Mana since 2001 and now leads two retreats each year, Easter and October. The theme for Easter in 2012 is “The grace of kindness: living the sacred in everyday life.” Earlybird bookings available prior to 16 January. Cost: A$600 (approx. )/ NZ$795. Please contact Mana immediately if you are interested in joining us as many people return annually for this exquisite retreat and places are limited. Body treatments available prior and during afternoon rest periods. You may extend your stay on either side of the retreat for a modest cost. Writing in Kyoto. This is a lively interactive retreat for writers or would-be writers at all levels. And especially for anyone ready to live and think more creatively. Writing workshops in the mornings with Dr Stephanie Dowrick. Guided explorations of the enchanting ancient city of Kyoto in the afternoons and evenings with Japanese-speaking William Suganda. Tai chi and meditation will be offered, and time for quiet reflection and writing, but this is not a spiritual retreat. This will be the third trip to Japan that Stephanie and William have led together. People can join the group in Osaka (or Kyoto) from anywhere in the world. Numbers strictly limited. Please email: William@inspiredtraveller.com.au to register your interest. To each of you, my heartfelt thanks for continuing to be part of this Network, sharing your stories and the values this Network promotes. It is the appreciation and encouragement that I absolutely need and I never take it for granted. I will write again in 2012. Meanwhile, may the blessings of peace and kindness be with you – and with our whole human family. You are in my thoughts and prayers.